If you are using a MIDI interface (such as an MPU-401 or Sound Blaster MIDI option) with an external MIDI keyboard, you need to connect the equipment using MIDI cables. It is possible to connect your equipment in some rather complex ways that may cause problems. If you contact technical support with a problem concerning equipment that doesn’t seem to be responding, we’ll probably suggest that you reconnect things in one of the ways listed here before we explore the problem further. Also be sure to check the Frequently asked questions chapter before calling us. If you have only one keyboard, read If your keyboard doesn’t have a MIDI Thru jack (regardless of whether you have MIDI Thru or not). 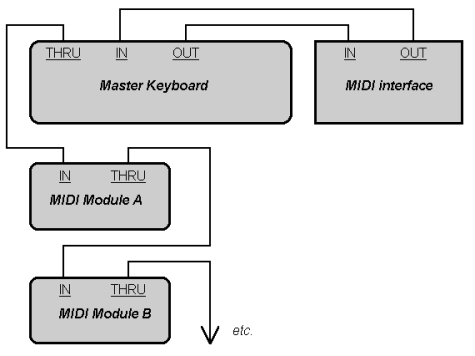 If your keyboard has three MIDI jacks—In, Out, and Thru—then use the following diagram. Connect the 15-pin jack to your computer’s joystick port. Connect the In cable to your instrument’s MIDI Out jack. Connect the Out cable to your instrument’s MIDI In jack. Continue the sequence, repeating the last connection for each of your sound modules. Each MIDI device should be set to a unique MIDI channel or range of channels to avoid note-doubling. Refer to the manuals for your MIDI devices for information on how to set their MIDI channels. Your MIDI interface may have a Thru jack as well as In and Out jacks. 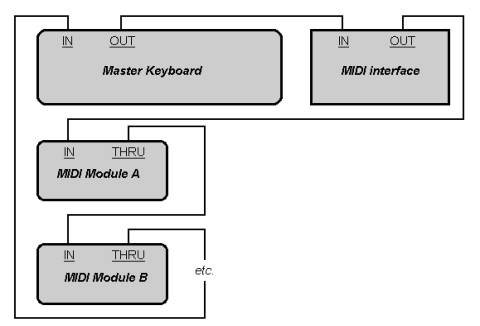 If your master keyboard lacks MIDI Thru, you can add more MIDI modules to your setup by connecting the MIDI interface’s Thru to the first module’s In. You can then chain subsequent modules onto the first module, as described earlier. If your master keyboard now seems to double notes (they sound thicker), or if you can play only one half as many at once, first make sure that no MIDI channel is being used by more than one of your MIDI devices.